In the first segment, In The Arch Villain Problem, the Arch Villain wreaks havoc on the city of Mathtropolis by turning everything into arches, Super Peg and Cat Guy come to the rescue. The second segment, The Straight and Narrow Problem, Super Peg and Cat Guy trail the Arch Villain, who has given up his arch ways and gone on a rampage with straight and narrow shapes instead – emphasizing diverse and acceptance of all kinds of shapes. 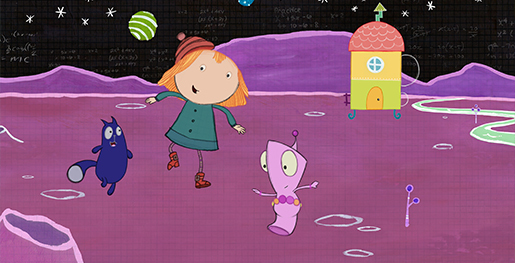 This Peg + Cat episode airs Monday, Jnauary 14, 2019 at 6 a.m. on WXXI-TV..
Peg + Cat is an animated math-based series for children ages 3-5 years old. The show follows the adorable, spirited Peg and her sidekick Cat as they embark on adventures, solve problems together, and learn foundational math concepts and skills. In each 12 minute episode, Peg and Cat face A REALLY BIG PROBLEM, a messy funny crisis they must somehow solve without totally freaking out!